Our Search Engine Marketing specialists took over SEO & website design for Fort Lauderdale Personal Injury Attorney Mr. Canter 6 months ago & today his firm is #1 on Google. He was with a much bigger law firm seo company in Fort Lauderdale but was not happy with the service he was receiving and wanted a local social media optimization company to deal with. We redesigned his logo, blog and website and put numerous high search traffic keywords into #1 positions on Google for him. As a token of his appreciation, he referred to his friend and colleague Robert Murphy that also became a client. 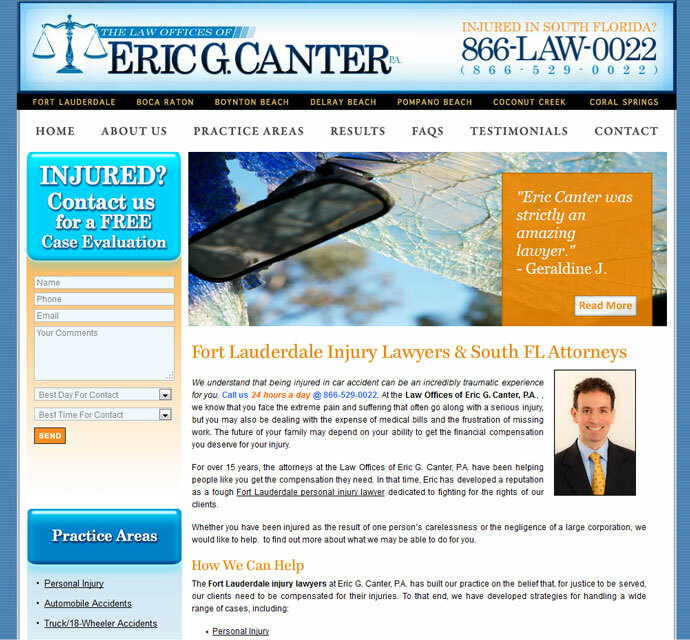 See our SEO portfolio to see exactly where Eric’s Ft. Lauderdale Car Accident Lawyers firm stands against the competition. If you are interested in hiring a great Search Engine Optimization firm that specializes in dealing with Attorneys, we are the right company for you. We have experience dealing with laywers in many different types of practices and guarantee our results!